Author(s): Muhammad Tariq Saeed Chani, Room#6, Building#115, Center of Excellence for Advanced Materials Research (CEAMR), Faculty of Science, King Abdulaziz University, Jeddah 21589, P.O. Box 80203, Saudi Arabia. Kh. S. Karimov, Sher Bahadar Khan, Tahseen Kamal, Abdullah M. Asiri. Zinc oxide (ZnO) nanopowder of size 50±10 nm has been synthesized using low temperature synthesis technique. The ZnO and multiwall carbon nanotubes (CNTs) were mixed in equal amounts. Both types of powders (ZnO and ZnO-CNTs) were tested to measure the effect of pressure using a specially designed transducer. 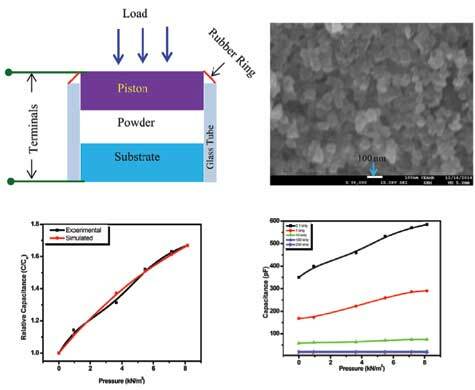 Upon rising pressure from zero to 8.15 kN/m2, the change in impedance was found 35% and 17% and change in capacitance was 41% and 10% while the change in impedance was 36% and 38%, respectively for ZnO and ZnOCNTs nanopowders. The observed changes in the electrical parameters may be regarded as the sample’s densification and porosity reduction due to pressure. With respect to ZnO-CNTs the ZnO shows higher change in resistance; that can be credited to displacement currents. Keywords: Capacitance, carbon nanotubes (CNTs), impedance, pressure sensing, transducer, zinc oxide nanopowder. Affiliation:Room#6, Building#115, Center of Excellence for Advanced Materials Research (CEAMR), Faculty of Science, King Abdulaziz University, Jeddah 21589, P.O. Box 80203, Saudi Arabia. Keywords:Capacitance, carbon nanotubes (CNTs), impedance, pressure sensing, transducer, zinc oxide nanopowder. Abstract:Zinc oxide (ZnO) nanopowder of size 50±10 nm has been synthesized using low temperature synthesis technique. The ZnO and multiwall carbon nanotubes (CNTs) were mixed in equal amounts. Both types of powders (ZnO and ZnO-CNTs) were tested to measure the effect of pressure using a specially designed transducer. Upon rising pressure from zero to 8.15 kN/m2, the change in impedance was found 35% and 17% and change in capacitance was 41% and 10% while the change in impedance was 36% and 38%, respectively for ZnO and ZnOCNTs nanopowders. The observed changes in the electrical parameters may be regarded as the sample’s densification and porosity reduction due to pressure. With respect to ZnO-CNTs the ZnO shows higher change in resistance; that can be credited to displacement currents.